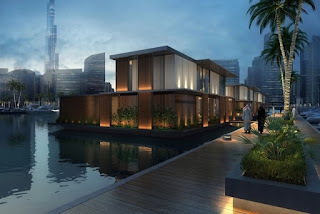 Floating homes will be the newest addition to the Dubai Canal as part of the Marasi Business Bay development. The houses are being constructed in Finland by the company Admares. The houses are expected to be completed by the end of 2017 and will be transported from Finland to Dubai then. There will be ten water homes, two restaurants and a yacht club at the Dubai Canal. The Dubai Canal will also feature the longest waterfront promenade in the UAE. There will be three separate areas of the canal which include The Yacht Club, The Pier and The Park.